It’s only been 6 days since I last wrote, but it has also been 31.5″ of snow later. 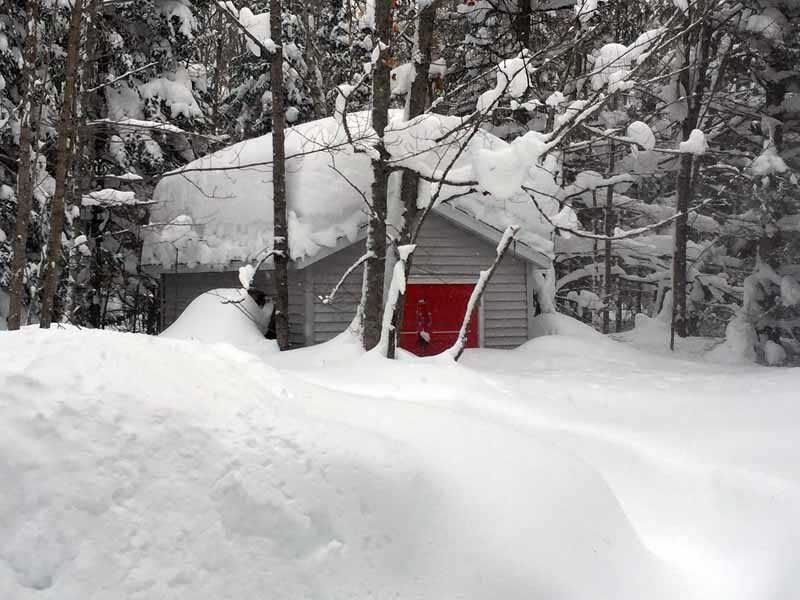 Yep, it’s been a pretty snowy week, even by Keweenaw standards. There are some beginning to wave the white flag. Some are surrendering outright, while others are are simply asking for a cease-fire, so they can re-group. Me? Bah…Bring it! Of course that is as long as I do not have to drive to work in it. Also as long as I can sit in the heated cab of my tractor, listening to tunes while I clear all the snow that falls! I may have some toughness still left in my, but mostly just grateful to be able to have all the resources I have to deal with it. I think I can still do a little chest thumping though. I did tough it out in the years before Big Red came along. I can remember a few storms in which I nearly collapsed while manhandling the walk behind blower not long after my first open heart surgery. I can also remember having to dig down through 4 feet of snow, just so that I could get to the firewood pile that only had a plastic tarp to protect it from the elements. Perhaps I am like the old, grizzled, war veteran that could go back into action if it absolutely had to happen, but has already paid his dues and lead a less strenuous life. The kids have really been piling up the snow days lately. If memory serves me right, they had all of Monday off, 1/2 of Thursday off and all of Friday off. In my opinion, they were all deserved. Some folks grumble about how easily they close schools these days, but I really do not see much of a change. I know when I was a kid and the blizzard of ’79 hit the Chicagoland area, it started on a Saturday and ended on a Sunday and we still got the whole following week off. Truth is, by about Wednesday or Thursday, all had been cleaned up and we could have easily gone to school Thursday and Friday. I didn’t complain! I guess my other thought is…Just because “back in the old days” we might have had to go to school in conditions that were hazardous and still survived, does that mean we should send our own kids to school when conditions are hazardous? I survived all of my trips in a car with no seatbelt on, but I wear one 100% of the time now. I survived being in buildings with lead pain and asbestos, but those two things are now outlawed. Ok, enough of my soap box. So before the storm even hit, we were warmed up with around 14″ of snow earlier in the week. Much of it coming Monday, causing what looked like a 2 hour delay in school to become the full day off. Nora has been reading about lots of folks who had problem with their furnace vents becoming clogged up. In most cases, its because of the water vapor in the exhaust freezing and clogging up the vent. I know ours is a PVC pipe that actually has the opening pointing down at an angle so that it cannot freeze up. It also sits around 8 feet off the ground, so would need some kind of doing to have it clog up from the bottom. In any case, to put hers and my mind at rest, I went and checked on Tuesday and got quite a surprise. 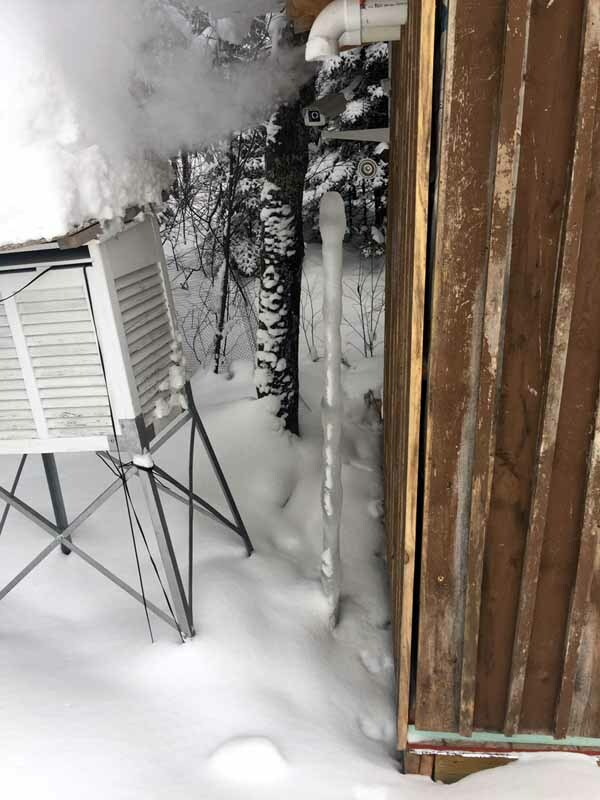 It was not clogged nor in immediate risk of being clogged up, but the dripping water from the vent pipe had created a 6 foot tall column of ice! Right after taking that shot I knocked it down, so we should be good for a few more weeks! So the big storm hit Thursday afternoon and continued into the overnight period. We actually awoke to light snow falling, I don’t think it has even stopped snowing for more than an hour or two in the past 2 weeks. However, the heavier stuff was not predicted to arrive until around midday on Thursday and it arrived around 1-2 pm. I was actually in a meeting that afternoon and watched the snow get heavier and heavier and the winds stronger and stronger and was relieved that they had let schools out at noon. I am part of the decision making process for the schools up here. I do not make any call as to if they should be open or closed, but I do provide the districts with the forecast that they use to determine if school is a go or not. They also coordinate with the road commission and with other districts superintendents. It’s a pretty involved and effective process. My drive home from that meeting was an interesting thing and when I got home, I helped get dinner ready and then after dinner, Grace and I went outside to play with the dogs. It was coming down quite heavily by then, I would say around 2-3″/hour. There would be brief moments when it slowed its intensity a bit, but then got right back on it. I figured there must have been some decent convection (like a warm season rain shower or even thunderstorm) going on to produce such heavy snowfall rates and also the brief lulls. Not too long after that, I went to bed, wondering what I would find when I woke up. I awoke around 4 am and looked out and it was still snowing. Not at the 2-3″/hour rate, but at least 1″/hour. I had cleared the hood of my truck off before coming inside the night before and there was a solid 8-10″ on it. When all was added up, the snows Thursday and Thursday night totaled 16″. Friday is our garbage pick up day and I am amazed a the conditions that they will deal with and still do a pick up, so I put on my boots/gaiters and other winter gear and loaded the garbage can into the truck to take it out to the road. 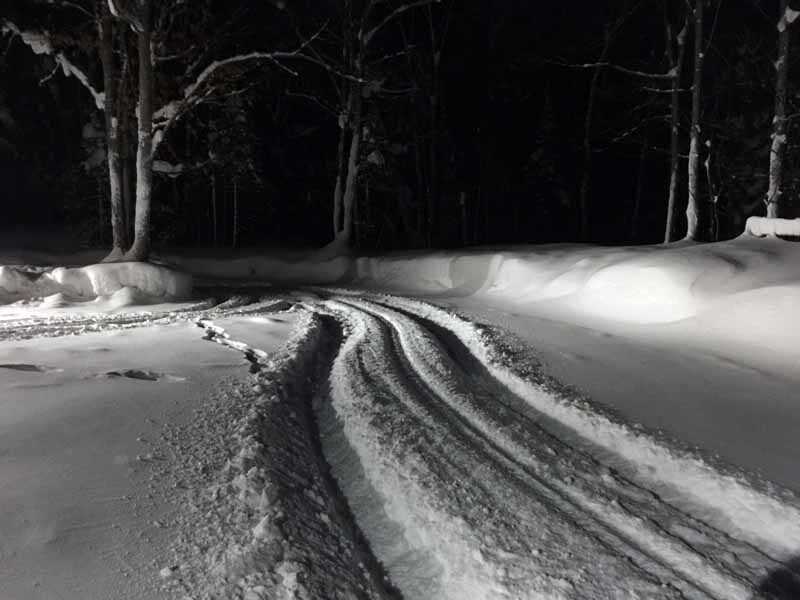 Once back, I snapped a shot of my tracks in the snow, I love it when not only are tire tracks left, but tracks from where the bumper was dragging in the snow and the transfer case for the rear axle was hitting the snow. That is when you know it’s deep! The heavier snow was over by Friday morning, but it did continue to fall all day. The winds were really nasty, blowing at 25-30 and gusting to 40. We picked up a few more inches of snow on Friday, but the main reason for the schools being closed was the blowing snow and wind chills reaching -25. 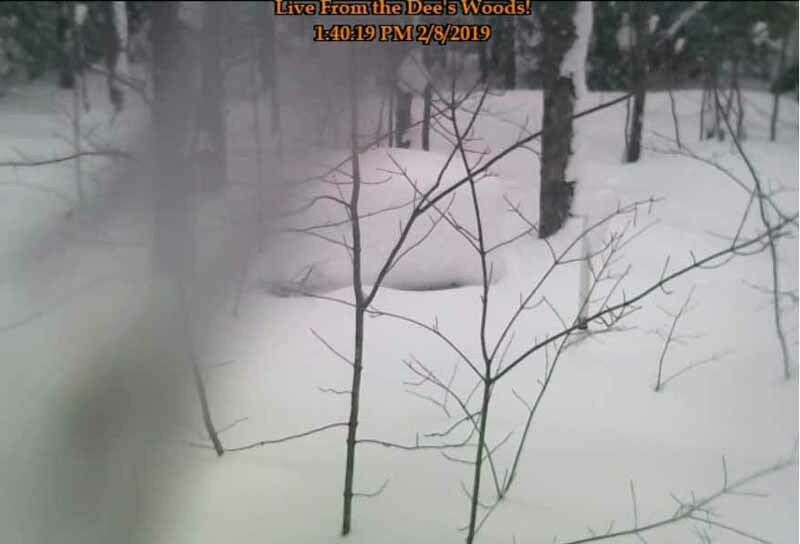 I have been keeping an eye on the spool on the Woods Cam and it became buried by Thursday’s snow event. My depth was also the deepest it has been all season at 49″. The snow has since settled and the depth is a paltry 44″, but looks like we will be adding to the snowpack noticeably this week as well. After clearing snow from our driveway Friday morning, the swing set was almost completely buried. That picture was taken around 2 hour ago, but the look has not changed much from when I cleared snow Friday. I suspect it will disappear with the snow indicated to fall this week. Once done with our driveway, I moved on to our neighbors. Ever since acquiring Big Red, I have gone down to clear her driveway. 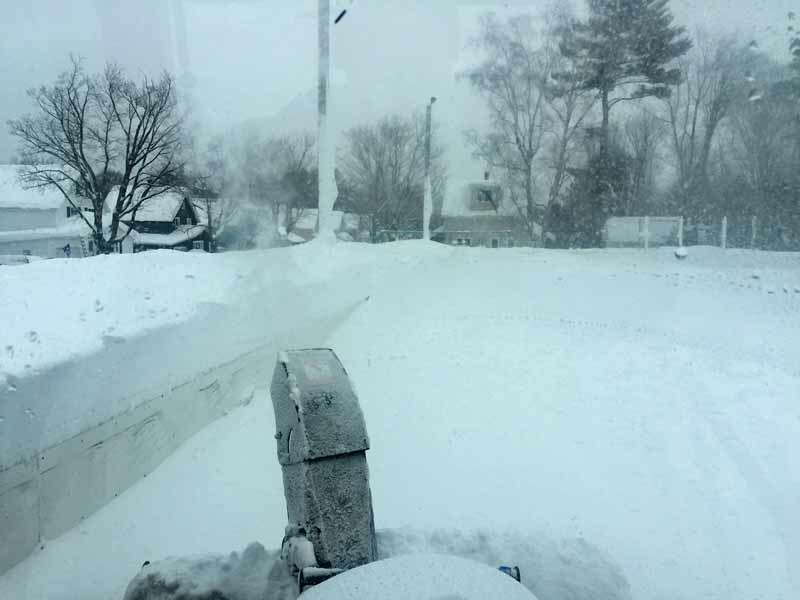 Her husband passed away about a year before I got Big Red and the driveway does not lend itself to being plowed, as the only place to push it is the road we live on and that is not a workable solution. He used to use a walk behind blower and that first year, another gentleman in the neighborhood used his truck and plow, but with the previously mentioned problems. One reason why I mention all of this is that my neighbor has a little shed in her yard and I always like to check out the amount of snow on it and watch it pile up on it and around through the season. I’m waiting for the season in which it completely disappears! Not there yet. After doing that clearing, I shot back home, jumped in the truck to get some more fuel for Big Red. The tank was showing 1/2 full, which would typically be enough to allow me to drive to the ice rink, clear it off and get home, but I figured this would not be a typical clearing of the rink. Upon my arrival at the rink, my suspicions were confirmed. I had some decent snow to clear before I could even get to the rink! 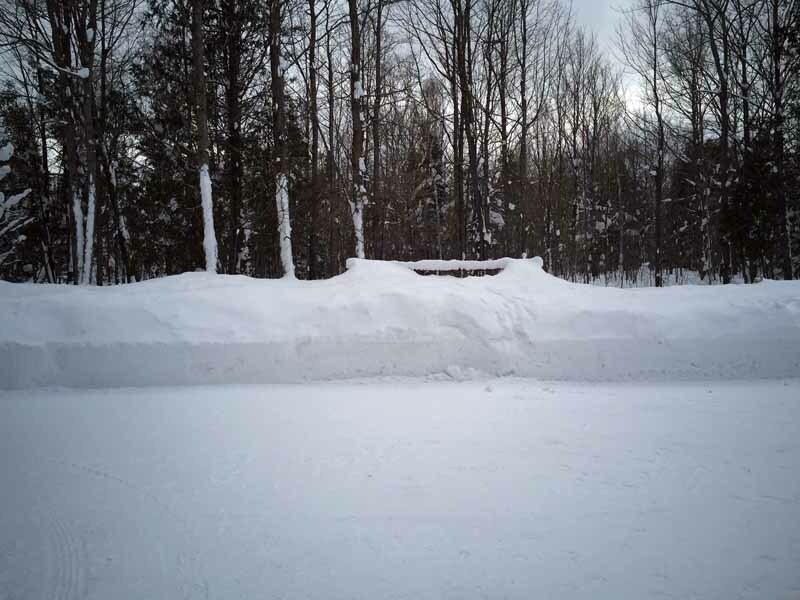 Once inside the rink, I could see I had my work cut out for me, as the snow was piled about halfway up the boards in most cases and in some areas where it had drifted, it was over the boards! It is really cool to be inside the cab of Big Red and watch it do it’s work in moving the snow. 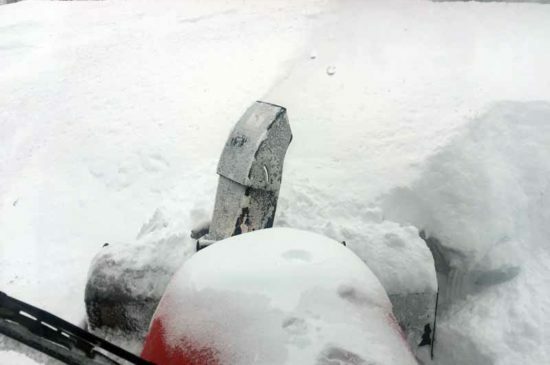 At times, the entire tractor shakes due to the hard work of the augers and impeller on the blower, but it has yet to meet it’s match…if I go slow enough and have enough traction. 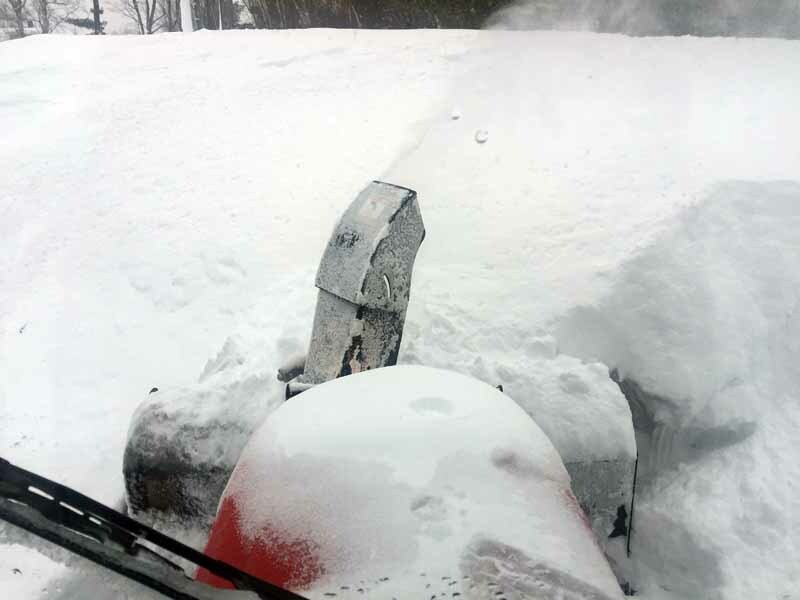 There are times I need to back up and gain a bit of forward motion to eat into the snow, but that machine and its blower do a magnificent job! After clearing the rink and then spending a bunch of time opening up more room to get to the rink (the township plows out the parking lot and a path behind the warming house for the rink), I headed home. All told, 4 1/2 hours from start to finish (including the break to get fuel) to move snow Friday! Not complaining at all! Best I can tell, everyone has dug out from all the snow last week. We had a nice weekend for it and are now getting ready for more. Roofs are being shoveled and front end loaders are out making room for the plow truck operators to push the snow to. We got our roofs shoveled last week before the storm hit. 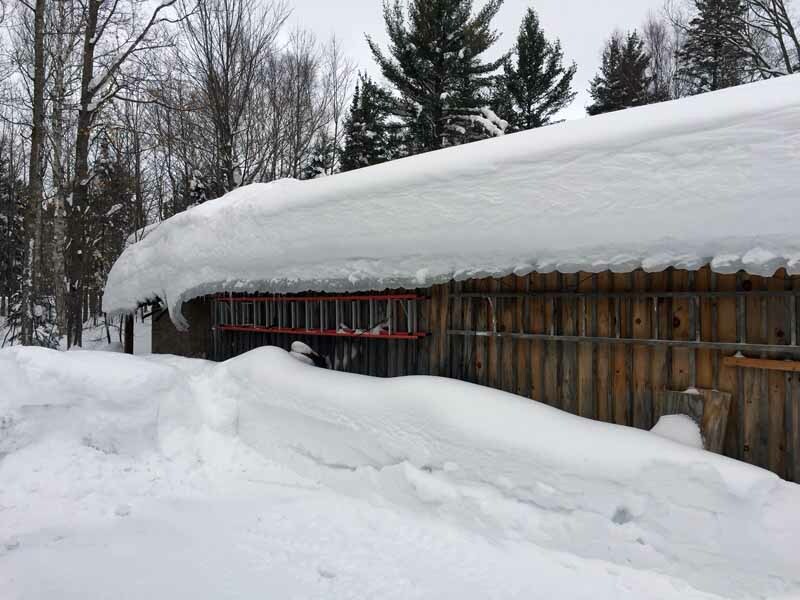 The wood shed and lean-to still need to be shoveled, but is not too hard of a job and I may tackle them myself this week. One way or another, they need it! Good night from a snowy Keweenaw..